Part of the mighty Machamp deck archetype of the Majestic Dawn format, Machamp became the champ of reeking mayhem on powerful big Basics as one of the bigger anti-meta decks of the time. Alongside Machamp Prime, the two could work in tandem to take on any deck in the format. Machamp is a Stage 2 Fighting Pokemon, 130 HP, with a Psychic Weakness, no Resistance, and a Retreat Cost of 2. Take Out is a 1-for-40 move that could instantly KO any Pokemon that wasn’t Evolved. Hurricane Punch is a 2-Energy move that flips 4 coins and does 30 damage per heads, and Rage is a 4-for-60 move that does 10 more damage for every counter on Machamp. Unevolved Pokemon may seem like they would be hard to come by, but during that time frame, there were Pokemon SP, which acted as Basic Pokemon even though they could have been the evolved form of a Pokemon, kinda like Pokemon-EX. Because Pokemon SP were becoming relevant, Machamp saw some niche play as a counter to them, since Take Out could…well, take them out with ease. Machamp Prime then became another attacker for the deck, usually used to KO anything that Machamp couldn’t. The deck saw some success here and there, at first against SP decks and then later on with Machamp Prime against other decks as well, becoming a fairly legitimate archetype. Its rise to fame though really started with this card, a tough cookie who worked hard to get everything down right. Arora Notealus: Machamp’s always been kind of a cool Pokemon, and I’ll always remember the early days of Base Set with that holo Machamp. Sure, maybe it wasn’t that good, but I’m glad he at least got some recognition as a card. Next Time: Rock on the modern way! Last Thowback Thursdays is about insane draw support; this time, today is about instant OHKOs! 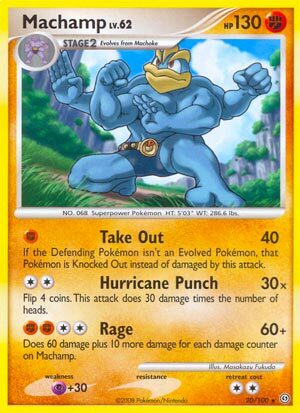 Another card that I suggested is Machamp (DP Stormfront 20/100) because of what I thought about during this card’s Standard tenure and present time. I used to think that this card was broken (which could be debatable), as I thought that automatically KOing a specific category is not healthy enough for the environment. But now? I would want a Pokémon that can constantly KO unevolved Pokemon because of players overusing Basic Pokémon. Yes, I’ll be talking about it’s first attack called Take Out. It costs F for 40 damage, but if the Defending Pokémon is an Unevolved Pokemon, that Pokemon is instantly KOed. So, what counts as unevolved Pokemon? Basic Pokémon is an obvious answer, as it comes into play. But even Stage 1 and Stage 2 Pokemon can be unevolved Pokemon because there is no card below the card. Think about modern times like Frogadier being summoned by Water Duplicates, since the other three Frogadier didn’t have Froakie under it, that counts as unevolved. What about Talonflame with Gale Wings? Since there’s no Fletchling under it, even a Stage 2 Pokemon is an unevolved. Lance Prism Star, Maxie’s Hidden Ball Trick, and even Archie’s Ace in the Hole brings unevolved Pokemon. Back to the past, Level X Pokémon of a Basic is also unevolved Pokemon as well as Legend Pokemon (two cards from your hand put into play; top half and bottom half). This card was reviewed once (https://www.pojo.com/COTD/2008/Oct/22.shtml) and didn’t get any follow-ups after that. Reviewers mentioned that it could be the end of AMU and other basics. AMU was a deck that centered around the lake trio, that is Uxie, Mesprit, and Azelf, as well as their Level X counterparts. As time passes by, there’s two mechanics that Machamp can prey to: Pokémon SP and Pokémon Legend. All Pokemon SP are Basic Pokémon, even if it Level Up. Those are cards that are similar to Trainer’s Pokemon, as it has the character icon on the bottom right of the art (Gym Leaders, Elite Four, Cynthia, Team Galactic, Cyrus, and even movie anime characters from Arceus and the Jewel of Life that are exclusive to Japan and not outside from it). Even fully evolved Pokémon (like Gallade SP) can be basic but has considerably low HP than their regular stage 2 counterparts. Pokémon Legend are multiple cards that formed into a group, much like what Break Evolutions position. You need what would be called a top half and a bottom half to form into a Pokémon. Which makes deck construction pretty harsh. A 4-per-copy rule means you can at best get two top halves and two bottom halves in a deck. Although it doesn’t say “Basic” on the card – it says “Legend” instead – it is an unevolved Pokemon, and Machamp will automatically KO it with Take Out. Before the infamous July 1, 2011 emergency rotation, Machamp enjoyed tag teaming with Machamp Prime and taking out 130 HP basics (Reshiram & Zekrom) from the Black & White series. Eventually, Machamp had rotated out, but even more mechanics began to rise. Basic EX Pokémon debuted in BW Next Destines and retired at XY Evolutions. They have considerably high HP with sometimes better attacks or abilities. Does not change that Take Out can still OHKO them for two easy prizes. However, XY has Mega Evolutions of EX Pokemon, and that – sadly – counts as Evolved Pokemon. It’s massive HP makes Take Out’s alternate damage pretty minuscule, but when you add in damage boosting cards from Pokémon, Energy cards, and Trainers, eventually Take Out can reach 2HKO levels. Break Evolutions count as Evolved Pokemon, so Machamp can’t automatically KO them. GX Pokemon can be Basic, Stage 1, or Stage 2, so Machamp can easily prey on Basic Pokémon, but can 2HKO at best against others unless weakness cooperated. And Prism Star cards are also basic Pokemon. Not only Machamp can OHKO them, but it can also send them to the Lost Zone! And you can even take THREE prizes if a Tag Team Pokemon gets KOed by Take Out! So Machamp takes care of maybe 75% of decks that focuses on Basic Pokémon, but what if you ran into evolution decks? Then Take Out does 40 damage instead. Two of its other attacks won’t be supplementing Take Out; Hurricane Punch is flippy, and rage is expensive. One can use it’s Level X to gain access to No Guard Poke Body, which lets Machamp do 60 more damage, but then it takes 60 more damage from attacks. Extremely risky power to use back then, so what about modern times if it was reprinted? There’s Machamp Break which makes its HP go up from 130 to 190 while maintaining a +30 Weakness instead of x2, making it considerably bulkier even when weak to Psychic. As for damage boosting cards, there’s Strong Energy, Choice Band, Diancie Prism Star, or Regirock-EX to help bring 2HKO territory (or OHKOs when weakness cooperated). Maxie’s Hidden Ball Trick can even summon Machamp without lower stages! All of this hypothetical support would make Machamp playable enough that will get other players to not rely too heavily on Basic Pokémon, as Machamp will take them out one by one. Notes: Considering what I’m getting into in terms of what’s trending in the Pokémon TCG, I can’t wait to get rid of Basic EX/GX Pokémon for easy prizes in casual league/play. Sure, it is a Stage 2 and it takes some work to get it into play, but Take Out’s capabilities are almost unheard of in the TCG, and it makes deckbuilders reconsider if they are going to mindlessly throw in lots of big basics to try to intimidate me. Machamp (DP – Stormfront 20/100) is our Throwback today and was originally reviewed almost exactly 10 years ago. Machamp is a Stage 2 [F] Pokémon released at a time when Rare Candy could take you from Machop to Machamp the first turn Machop hit the field except for T1 because the player going first couldn’t use any Trainer cards (modern definition of Trainer). The very NEXT set contained Broken-Time Space, so you also had the option of just manually Evolving from Machop to Machoke to Machamp in a single turn as well. I’m going to have to admit I don’t recall the quality of the [F] Type at this time, and I’m sneaking this review in with almost no time to spare… in fact, this is the “placeholder” version. So we’ll jump to the part of the card that mattered most: its “Take Out” attack, which does 40 for [F] UNLESS the Defending Pokémon is not Evolved, in which case you get an automatic KO via the attack’s effect. This attack seems insane now because we have a metagame with massive Basic Pokémon worth 2 Prizes when KO’d, soon to be joined by massive Basic Pokémon worth 3 Prizes when KO’d. However, that is tempered by being a slow Stage 2. Flip the script for back in the day, when you could speed Machamp to the field but largest Basic Pokémon were usually only worth a single Prize when KO’d. There may have been a little overlap with the original Pokémon-ex or Pokémon LEGEND cards, as Stormfront was the final DP-series expansion. Pokémon SP were a major presence in the metagame, though, and they were usually Basic Pokémon or LV.X cards… and LV.X cards aren’t treated as Evolutions, but instead have the same Stage as the Pokémon under them. This means a LV.X on a Basic Pokémon would still be treated as if it were not an Evolved Pokémon. Would I like a card such as Machamp to be released now? Absolutely NOT! This isn’t how you achieve balance, this is how you FAKE it, something the game has done far too often. I don’t want the game to fake it, I want them to realize the game’s pacing needs to slow down a bit so Evolutions have the time and for less “filler” in Evolving Pokémon. This would balance out the speed and card advantage of Basics versus Evolved Pokémon. I’m not sure if something too close to Machamp would even be effective, as you have to go through a turn of Machop so you’d have to perfectly “stream” them and hope your opponent’s deck doesn’t run any worthwhile Evolved attackers.